We’d just finished our first Dosa since Penang the previous winter, its savory potato masala blending in our mouths with tangy mint chutney christening our yearly sovereign to the tropics after a long season of gardening in Minnesota. Leaving the cool flurry of a dozen squeaking ceiling fans in the narrow restaurant, we reemerged into the sticky air along Mumbai’s famous Colaba Causeway to continue our conversation. Just steps from the door a young Indian man in western dress inserted himself into our jet-lagged confusion of needing train tickets for our impending journey to Goa. His slightly curly black hair was slicked back with gel and a large cubic zirconia adorned his left ear. The tight khaki jeans and converse t-shirt hugging his small frame exuded a stylized appearance of a 20-something Indian hipster. He flashed a beaming smile as he introduced himself as Rahul and glided into the cursory questions one receives from nearly every local when visiting a foreign country. He did so in a clear, comfortable English with the rolling accent unique to India but peppered with Western slang. It is a vernacular obviously developed from much time spent with western backpackers and tourists. His concern was for the jasmine flower bracelets that adorned our white wrists. Kyle had already pointed out during lunch that these were our sucker bracelets and Rahul confirmed this immediately. While cajoling near the touristy Gateway to India we had been approached by a pleasant woman who claimed she was in Mumbai on a Catholic mission from Chennai and assured us she wasn’t asking for money; she only wanted to practice her English. She casually then grabbed each of our wrists and adorned them with a beautifully scented jasmine flower chain so quickly and persistently that we hardly had a moment to refuse. This would prove to be her linchpin move. She then asked if we would buy her some dehydrated milk for her children, insisting again that she was not asking for money. Unable to shake off her pleading we were taken to a stand across the street where a shopkeeper immediately produced a dusty can of dehydrated milk and asked a preposterous 750 Rupees for it. Exasperated with the process and wanting to extricate ourselves from the tiresome scam we handed the woman 50 rupees and departed. Rahul confirmed this duo scam and seemed pleased to hear we did not pay for the “milk”. He further warned that we would face many further attempts to separate us from our Rupees in the villages, countryside, and beaches that lie ahead, something that came of no surprise as scamming is certainly not a phenomenon specific to India. Rahul claimed to be a student by profession, though he may have been using the term a bit abstractly. He would later elaborate that he was a student of the tourists, each day expanding his knowledge of wide variety of foreign languages and demeanors. Rahul is also surely a guide by profession and an entrepreneur by nature although he never outrightly said it. Acting as an independent and informal guide Rahul befriends tourists and navigates them through hectic Mumbai connecting them with the shops, services, entertainment, and attractions they are seeking. With this system he collects small commissions along the way and though he doesn’t charge his guests a fixed rate he does make it known that if they wish to provide him some monetary help, he will gladly accept. Rahul’s demeanor made him seem immediately trustworthy and likable and despite our suspicions to familiar advances, we immediately decided to follow our intuition and accept him as our guide and companion for the following days. While navigating us through the chaotic city, he would reveal himself to be an incredibly intelligent, humorous, and kind soul. Without a sliver of pushiness he would offer an array of customized restaurant and attraction options all the while offering repeatedly to leave us to ourselves should we want to go elsewhere or return to our room to relax. He quickly transformed from guide to friend and we found ourselves increasingly grateful for his advise and companionship. 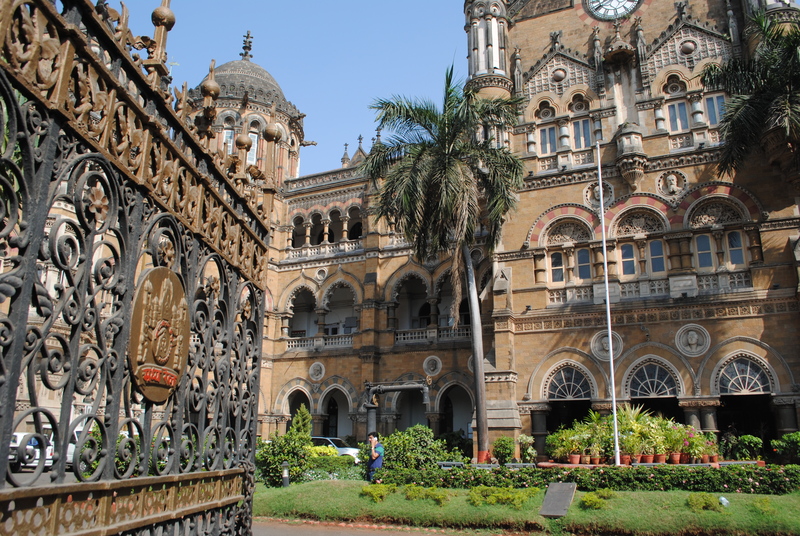 Our need to purchase onward tickets was also Rahul’s ticket into our Mumbai itinerary so we set off following him through the busy streets and narrow lanes of historic Colaba. As the primary western port and mercantile center for the British East India Company, the legacy of colonialism looms high above the streets in the baroque, centuries old buildings. Combining Victorian, Byzantine, and classic Islamic architecture; each is intricately adorned with a dizzying variety of ornate arches, spires, gargoyles, crosses, and minarets. Falling into disrepair as investment shifts to the glistening skyscrapers of the new commercial districts to the North, the artful designs are imbued with further complexity by the spider web of whitewashed patched cracks, the Pollock-esque splatters and blotches of black mildew, and the crumbling facades eroding with the salty gusts blowing off the Arabian sea. These blemishes transfix the architecture with a decaying grandeur much more lovely and appropriate than had the buildings been neatly preserved and painted. The grandiose colonialism seems an odd pairing for the sea of colorful saris, orange-dotted third eyes, and turbaned heads on the bustling causeway. Here Mumbai failed to live up to its reputation for being impossibly dirty and suffocatingly hot. Instead, the sidewalks were spotless, swept clean by shopkeepers with brooms made from bunches of thick dried grasses bound with twine. Crows with thick sharp beaks and clean iridescent black feathers populate the boulevards which are densely vegetated with giant, tangled strangler figs, their roots winding tightly over the curbs and around small statues of Ganesh with sticks of burning incense wedged into their tangled roots. Elegant and sprawling canopies of Persian silk trees wrapped in vines and bursting with flowers of yellow, pink, and orange provide a refreshingly cool shade in a city renowned for its sweltering heat. 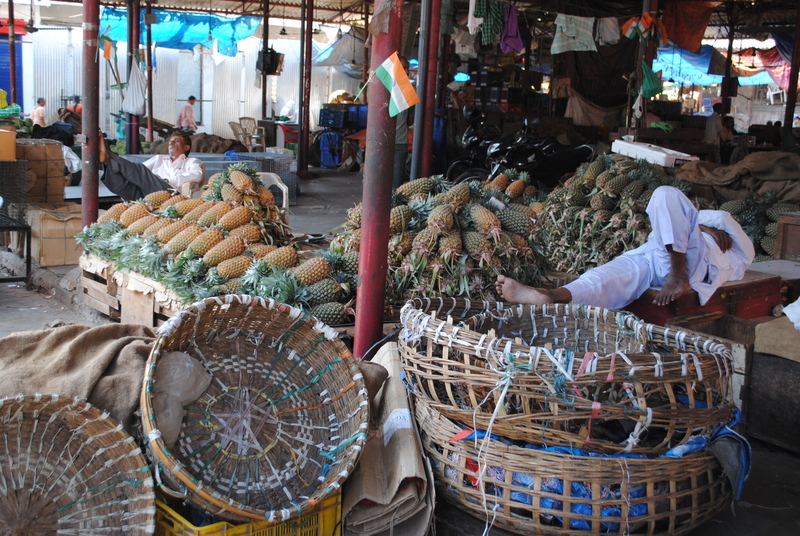 These trees also provide shade for the workers and shopkeepers who set in motion the bustle of Mumbai’s boulevards and markets. Ducking out of the street scene we entered the cool, clean, office of a few young travel agents. We had tried unsuccessfully to book train tickets to Goa from our home in Minnesota during the weeks before. The online booking site only allows you to book tickets between 12 and 4 pm Indian Standard Time, which meant 12:30-4:30 am Central Time and we soon discovered during our late night forays the site was useless without an Indian phone number. As seasoned travelers who have usually succeeded in arranging onward tickets ourselves or even better through our hotels, we were somewhat annoyed to have to pay commissions to a third party travel agent. In India we’ve learned it is unavoidable so we ducked inside the only agent on the causeway. A few agents shout back and forth. The one at the desk we are sitting at admires his new iPhone 6. I was beginning to feel relieved. I knew I could book any plane ticket myself. “No, thank you. We’d like to think about it.” We said casually hoping to avoid the mounting pressure to book. At this point the agent’s determination began to escalate. Later that evening we discovered the rate the agent was charging was double that of India’s budget carrier SpiceJet, the airline he would inevitably book. In India, where ever you shop, if you show great interest in purchasing goods or services you will surely be offered Chai tea. The travel agent left us edgy, Rahul could surely tell, so proceeding onward we stopped at one of Mumbai’s infinite and ubiquitous Chai stands where we sipped the intoxicating blend of boiled water, milk, cardamom, ginger, and nutmeg out of tiny glass cups to help deal with our mind fog and settle our nerves after our first of many encounters with the persistent and pushy Indian salespeople. Reinvigorated by India’s beloved drink Rahul offered to take us to the local market to buy Indian dress, something he considered important for traveling through the Indian countryside. We obliged and were taken to a clean, bright Indian clothing shop with stacks of the traditional clothes piled high on shelves that stood floor-to-ceiling. Its owner spread out a vast assortment of Sawar kameez and kurta combinations encompassing a full spectrum of bold, vibrant colors swirled in intricate designs on light airy cotton. 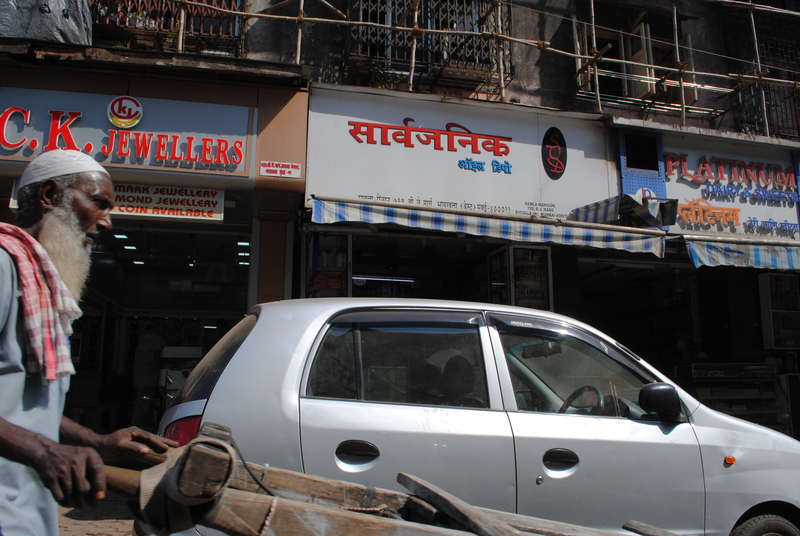 After making our selections we moved on to one of Mumbai’s finest Kashmiri rug and pashmina shops, whose exported wares can also be acquired at fantastic cost in the storefronts of boutiques from Manhattan to the fashion centers of Europe. The masterful craftwork inside was stunning, particularly the one square meter pieces which are a once in a lifetime work by Kashmir’s most elite craftsmen and contain 4000 silk knots in every square inch. Nearing dusk, the sky was alive with birds. Perched on the peak above of our rooftop restaurant was a large, black hawk, its broad chest puffed confidently outward as it’s intense, stoic gaze scanned the city far below. From here with the hawk we watched the sun redden and become obscured as it collided with the haze of pollution and humidity on the horizon. As the sun sets, simultaneously white and golden lights ignite the Queen’s Necklace, the perfect semi-circle of coastline encompassing the docks of Colaba to the south, then running north behind the massive seawall protecting Marine Drive where young couples meet to steal kisses away from the prying eyes of their omnipresent family; past the wedding tents designed like modern castles, where the sons and daughters of Mumbai’s elite are introduced to hundreds of guests on top of elephants and horses accompanied by a regiment of elaborately clad dancers in orange silk suits, jeweled turbans and swords befitting of a Bollywood blockbuster. 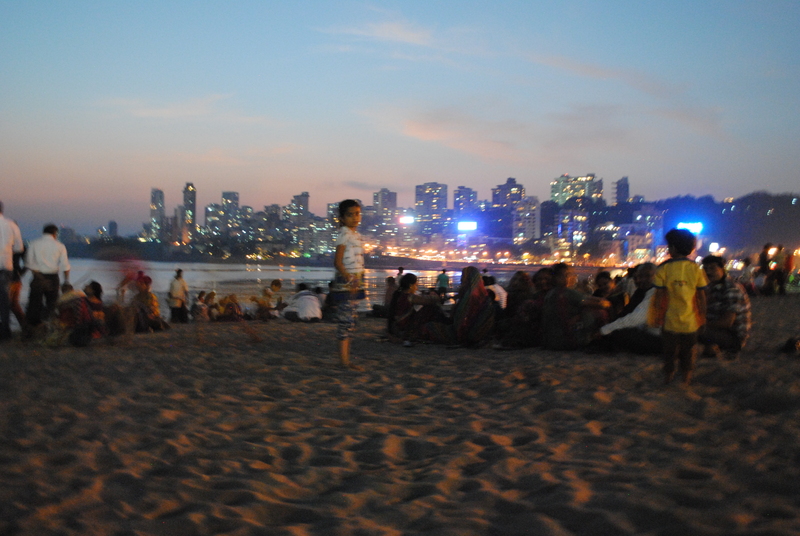 It continues past Chowpatty beach where middle class families meet at sunset to eat samosas and sweets while their kids splash fully clothed in the sea; finally circling back on itself at the gilded luxury high-rise condos of Malabar Hill. Like the raptors perched above the city, Mumbai’s elite gaze downward with watchful eyes through floor-to-ceiling windows from the heights of the many new condo buildings shaping Mumbai’s growing skyline. At the inappropriately named hanging gardens one can look up and see the modern architectural majesty that is the home of Indian billionaire Mukesh Ambani. With the exception of Buckingham Palace, this is the world’s most expensive private residence. It is home to a family of five, their 600 servants, 160 cars, a temple, a room that makes snow (lest you get overheated), and every other luxury a 27 story single-family home might possess. Across the gardens, the owner of Kingfisher beer and airlines has his multi-storied perch of garden terraces which according to local gossip and tabloid hosts weekly parties rife with the debauchery that only the overseer of Asia’s largest brewery and an army of stewardesses could command. Below the perching hawks, Indian Ring-neck parakeets fly, play and squawk with joy over the patchwork of the old ornate buildings and their newer, boxy neighbors. Their roofs are dotted with large black water drums and lush gardens grace the terraces and balconies draped with colorful laundry fluttering like the flags of an armada in the breeze. Between these buildings Hindi women gracefully glide down the sidewalks with arched backs and heads held high in perfect posture. Their large dark eyes and flowing black hair highlight the explosion of color in their saris and shimmering golden bangles that hang loosely around their delicate wrists that bear the fine swooping maze of black lines that are henna designs flowing down to their long, ringed fingers. 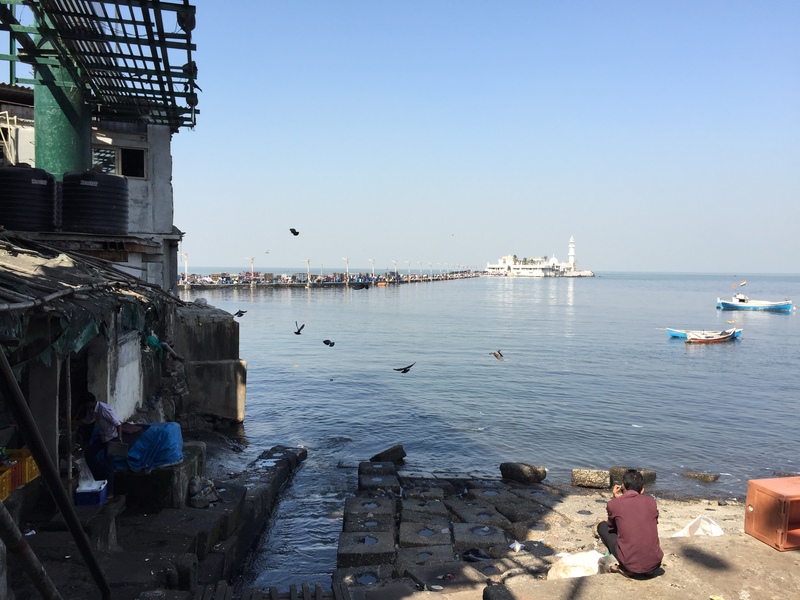 Muslim men in spotless white linen outfits, neat beards and stitched Taqiyah make their way via a narrow footpath during low tide to the shining minarets of Haji Ali Mosque, which floats like a mythical ship on the Arabian Sea. While spice king Shared, whose tall, thin frame and narrow chiseled face held high radiating pride because he knows he extols every effort to deliver superior quality work. 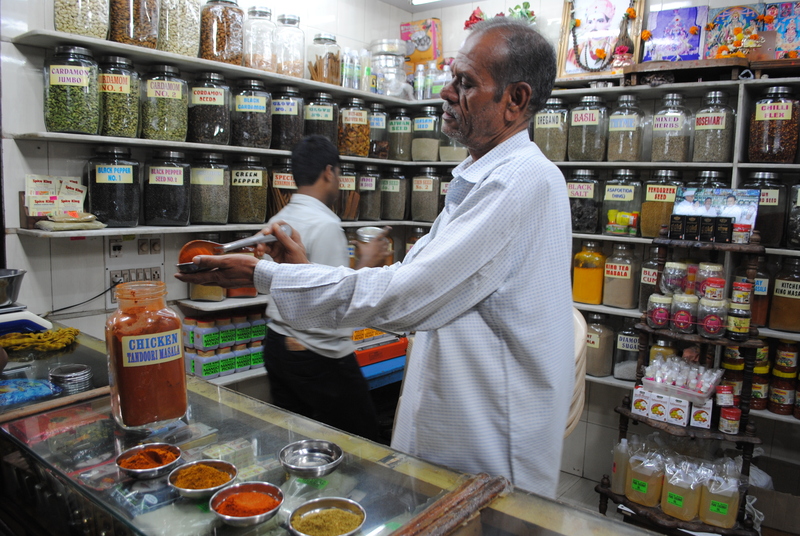 In his modest stand in the Crawford Market he scoops heaping spoonfuls of powder-fine blazing orange, red, and green hand-ground spices from shelf after shelf of large glass mason jars; pouring them into small silver dishes on the counter so clients can salivate at the aroma of his heady, flavorful concoctions. Throughout the day we passed hundreds like him; craftsman, shopkeepers, and merchants pouring their energies and livelihoods in the vibrant economy dozens of stories below the financial centers, technology conglomerates, and Bollywood studios. On the street multitudes of pigeons survive on discarded scraps of food and scattered seeds left for them by the local Hindus, ever-pious and charitable toward the animal world and the meekest of the meek. 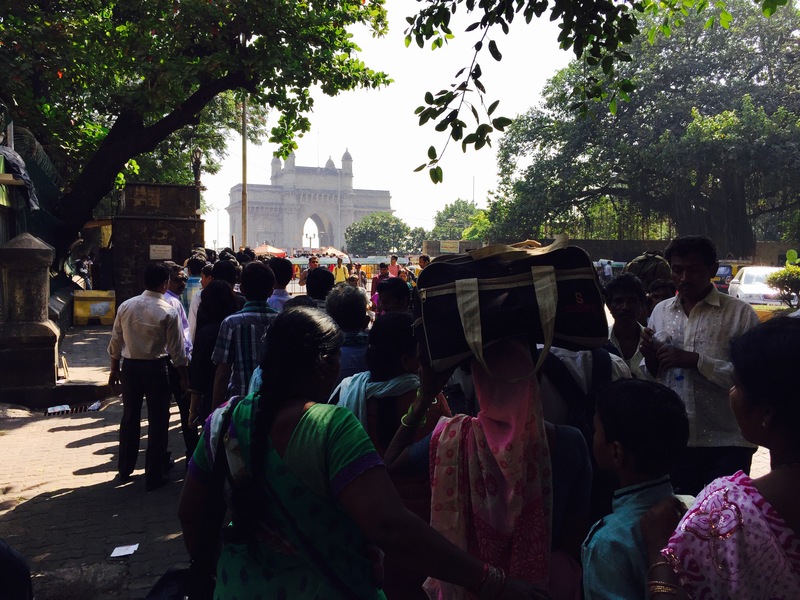 They gather in flocks in between the shadow of the decadently opulent Taj Mahal Hotel and the equally gregarious stone archway of the Gateway to India protruding out into the bay and commemorating the 1911 royal visit of King George V to his bountiful fiefdom. This is also where in 1948 the last of the British soldiers held a paraded retreat at the dawn of independence for the world’s largest democracy. In the once open squares now barricaded in the wake of 2008 terrorist attacks, it is ironic in a country built on ahimsa, nonviolence, where life is exceptionally segregated and death can feel desperately mundane that an ad hoc sanctuary for the lowly pigeon serves to protect the common person from sudden terror. The largest section of Mumbai, the blood that pulses through its asphalt veins are its poor. Some 60% of the city’s residents live in slums while thousands more sleep on the streets and arrive each day to pursue an easier more fruitful life in the prosperous city. While slums are conveniently hidden from view, they and their inhabitants are far from invisible. 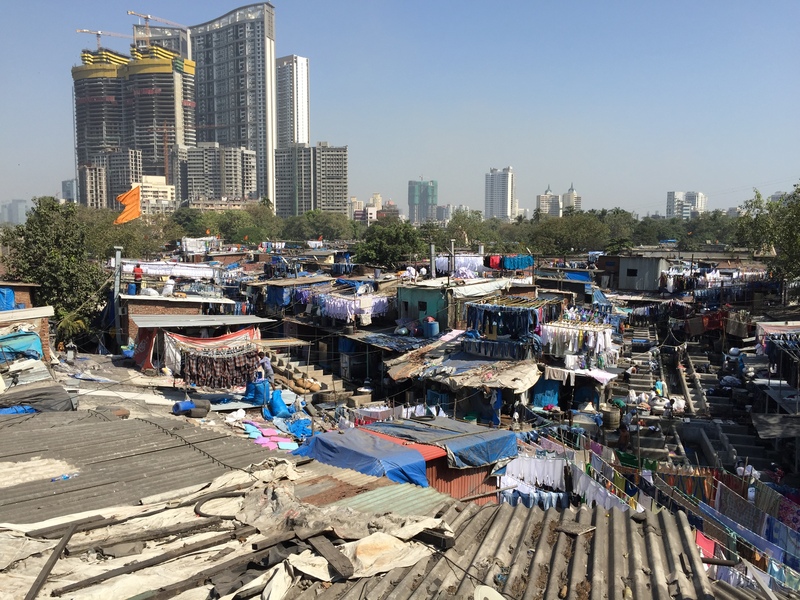 Immediately after leaving Mumbai’s airport the first few kilometers of highway are bordered by these shantytowns. A tangled, tattered maze of corrugated metal, scrap wood, and plastic sheeting twisting through narrow pathways with each family’s tiny shack balanced precariously atop another crisscrossed with narrow footpaths, ladders, and bridges. If you are arriving at night and traveling to the heart of Mumbai you will pass hundreds of people huddled close, sleeping under thin blankets on the sidewalks only meters from plate glassed windows of Bentley and Mercedes dealerships illuminated like the heavens by an army of florescent lights kept running hours after closing. A single slum can be populated by several thousand to a couple million people. Within them they build their own self-contained economies and the modern city outside their walls is completely dependent upon their work. In a place where littering appears to be the correct way to dispose of trash, the municipality has little need for waste removal services or recycling as many of the most poverty stricken depend on collecting, sorting, scrapping, and recycling the cities discarded rubbish. Man pushes wooden hand cart around the growing population of automobiles. For the most part, all but the most destitute in the slums do have jobs be they formal or informal. They are the rickshaw drivers, construction workers, street vendors, cooks, prostitutes and government school teachers. However with so many people and such competition, low wages mean that those who toil the hardest often still remain relegated to the slums. The vast majority come from outside the city. They travel from villages across India and even the world; Tamils, Gujaratis, Karnatakans, Kashmiris, Nigerians, Iranians; Muslims, Hindus, Janes, Buddhists, and Christians all living together in the cramped island city. One looks out over the poverty-stricken slums and wonders what could possess someone to leave their homes for such squalor. Yet what the city offers, what runs through it’s streets like rainwater in the monsoons is hope; hope for an opportunity at self-betterment. It’s something that is lacking in the villages dried up in age-old feudalism and caste bias. The hope for advancement is often multi-generational with parents in villages scrapping together enough to send a child nearly penniless to the slums with hope that they may find enough work to send siblings and children on to slightly better lives or some smattering of education. While the social structure is such that many of these dreams remain unrealized and unfulfilled, simply the presence of a small sliver of a chance is an incredible motivator and it pushes more and more people day after day to seek out India’s throne on the Arabian Sea. Hard Hats not required. 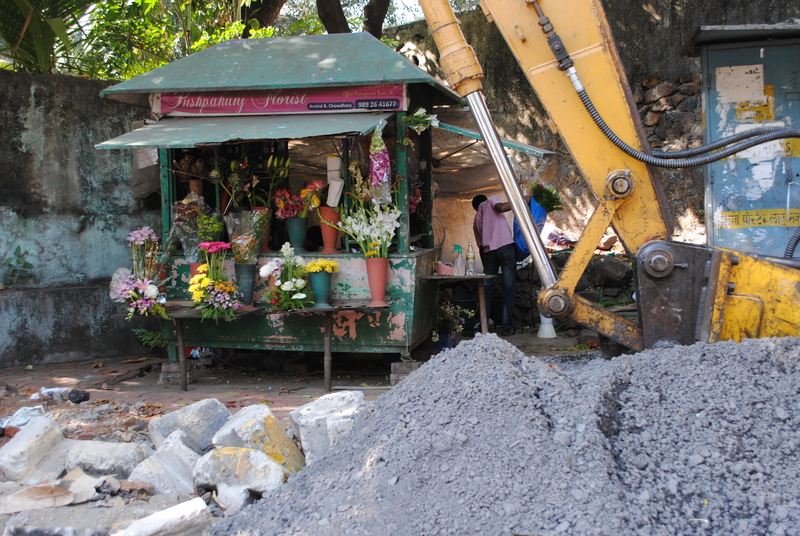 Business is crammed into every available nook, even in the middle of construction zones. From each village, city and state the multitudes bring with them their own personal tales of struggle, perseverance, hope, culture, and family left behind. 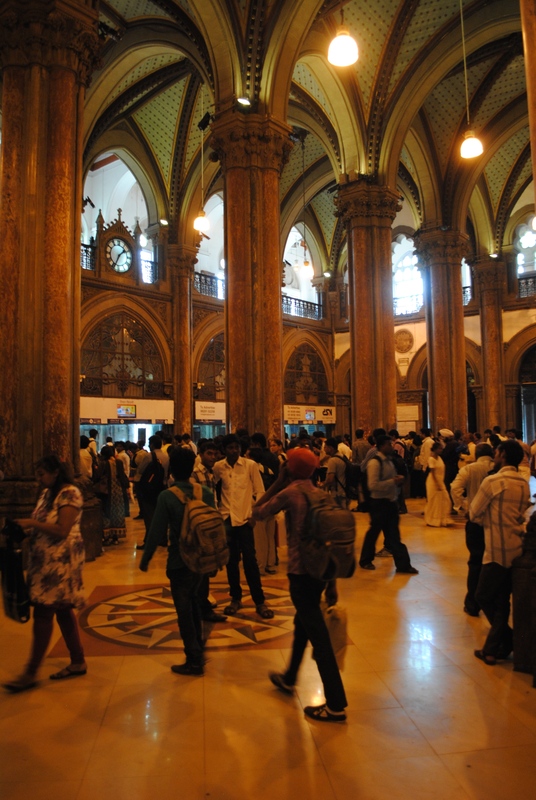 Mumbai is at its heart the conglomeration of 20 million stories and Rahul’s is just one. He comes from a town just outside Jaipur in state of Rajistan. Like so much of the Indian countryside, jobs are scarce, particularly for someone whose parents could not afford to send him to school. Rahul was however able to pick up some English working with tourists and with this knowledge and a small bit of savings he travelled south to Mumbai and moved in with cousins. 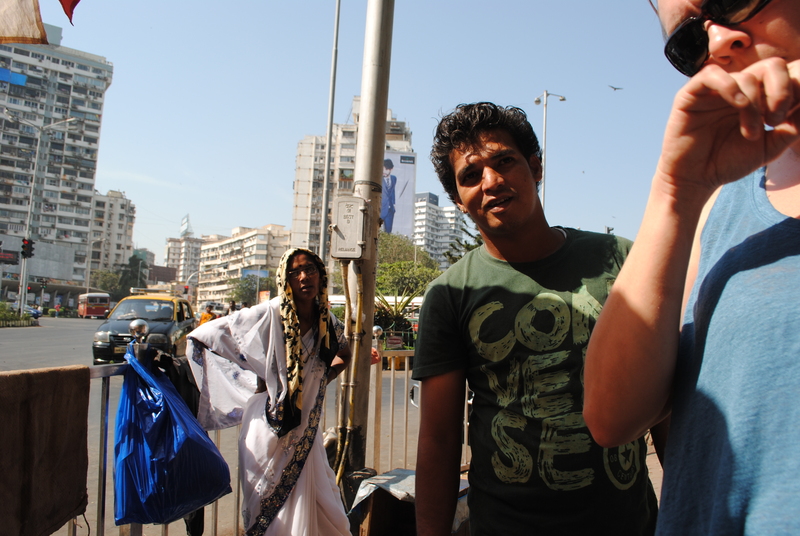 Working the Colaba tourist beat he’s expanded his language skills becoming fluent in English and French while developing a growing vocabulary of Italian, German, and Spanish all while retaining his childhood knowledge of four local dialects. It is one of the sad contradictions that comes with deep social inequity and lack of access to resources to find a man that is on the one hand highly intelligent, entrepreneurial, and personable with a command of eight different languages yet is also illiterate and unemployed in the sense of having no consistent formal profession. But Rahul is highly driven and like so many, he is brimming with hope. In the short-term he hopes to save enough to purchase the license necessary to be become an official city guide that would allow him to earn higher rates and work for hotels and travel agencies. In the long-term he aspires to continue his personal education learning to read and write while being able to send more money home to Rajistan to support and educate his family. The progress may be incremental but any little bit helps. If you’re traveling this way, you’ve already got a friend in the city. You’d be hard pressed to find a better guide. Accomodation: We were quite satisfied with the Bentley Hotel. It’s conveniently located overlooking the sea on Marina Drive. The rooms were clean, the staff was friendly, and the rates were reasonable. 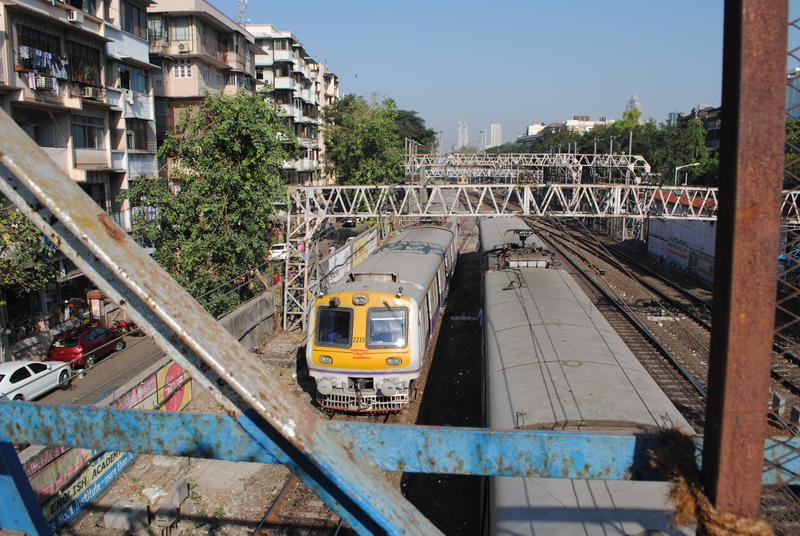 Train travel is the most widely used form of transportation in India. 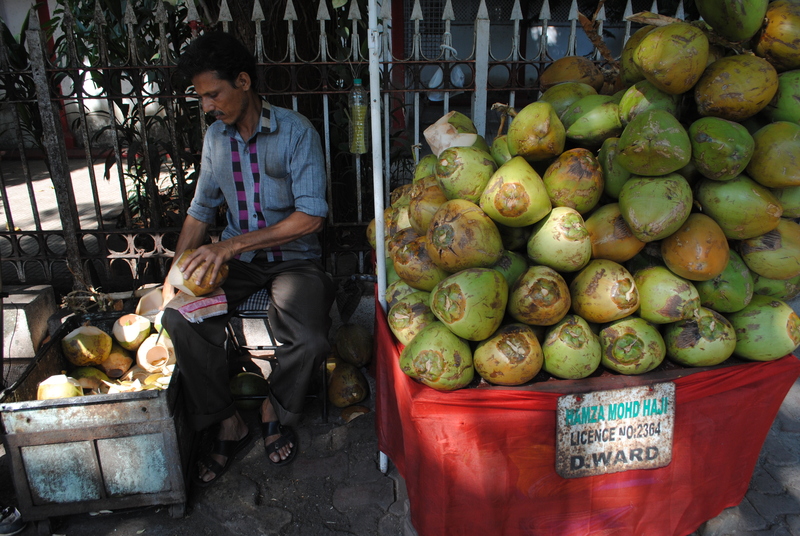 Coconuts are widely available in Mumbai and India. They are a great way to hydrate without plastic waste or worry of water contamination.